Just a note to tell you how much Deb and I enjoy having Sierra in our lives. She has grown from the little 20-pound puppy to nearly 60 pounds (and I forget she is still a puppy!) and is healthy and happy in the houses she now controls. You have seen the pictures of her at Lake Tahoe. Those are some of our best times with our early morning walks along the beach and chasing squirrels she will never catch. This, I believe, has been a mutually beneficial relationship. Sierra gets the security of a loving home and we get unconditional love. In retrospect, we got the better part of the deal! Thank you so much for bringing her to us. 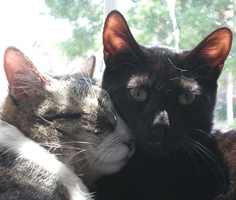 Gus & Winston – Best Friends! 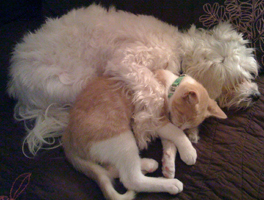 Gus the pussycat, formerly known as Latke by his foster family, was adopted and in record time became best friends with his canine housemate, Winston. Now they spend endless days together having fun and catching 40-winks. Life is good for this darling pair! We adopted our kittens Losang (brown tabby) and Deva (white long hair) a bit by accident. I am an Unconditional Love board member and my husband is a UL volunteer, so we are surrounded by cute animals available for adoption all the time. Usually, we have tons of self-control. But one fateful day right before Memorial Day 2006 was different. That was the day that Losang (named for a venerable Tibetan Buddhist lama) and Deva (named for the Hindu word “goddess”) decided that they were coming home with us. They did, and the rest is history. They made themselves right at home with a 16-year-old feral cat named Moire and a benevolent, 12-year-old Akita/Chow mix elder-statesman dog named Kuma San. 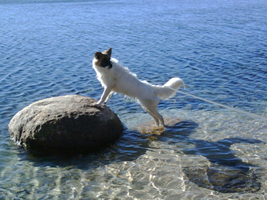 Moire and Kuma have both now gone over the Rainbow Bridge and Losang and Deva rule the house. Deva runs up the walls, Losang loves to hang-out in the wet shower. Both stalk squirrels safely from the comfort of the back of the couch, they play “feline mixed martial arts” around 10:30 p.m. each night and as a pair they are inseparable. We are grateful to their UL foster parents who loved, nurtured and cared for them both when they were rescued at the tender age of 2-weeks-old. Deva nearly died of upper respiratory and was saved by the sheer tenacity of her foster mother Lisa. Our lives are blessed beyond measure by Losang and Deva’s spirt of fun, the loving kindness they show one another and us, their interest in all things “feather” and the curiosity that keeps them young and fills our home with boundless kitten energy. Nothing could be sweeter! Onyx became part of our family Thanksgiving of 2007. We were devastated after Phantom, our kitty of just over a year passed away suddenly. Our home felt really empty with just 1 less family member! We were not ready to move on, but when I spoke to Lisa a few months later, she thought she had the perfect kitty for us. Having very little resistance to paws and whiskers, we visited Onyx (then Bug), and we were instantly in love! He was the sweetest, warmest little thing, an old soul really. Today he has grown into a handsome, albeit goofy cat. His sister Misha is the center of his universe, then come his people family. He loves to cuddle and makes the cutest chirruping sounds. We are a complete family again thanks to Lisa and Unconditional Love! Sir Julius, Great Pyrenees Extraordinaire! Our home is owned by a 120-pound Great Pyrenees dog named Julius. He is so beautiful that a typical walk elicits gasps from nearly everyone we pass. Long white eyelashes . . . beautiful, soft plush pure white fur . . . oh, so gentle and wonderful with everyone he meets, from kids to adults to other dogs. Inevitably, we are asked on a daily basis, "From which breeder did you buy him?" And we smile and explain that we did not purchase Julius from a breeder. We found Julius in a high-kill shelter, covered in mats, filthy and sad, with creaky joints and a thyroid issue. The fact is, he was left to die there, like so many animals who have worn out their families' welcomes just because they need a little extra tender loving care in order to spend their golden days as they should--loved, warm, and snoring on a bed specifically designed for the joints of aging puppers. Walk the hallways of any shelter. There are Boxers and German Shepherds and Cocker Spaniels. 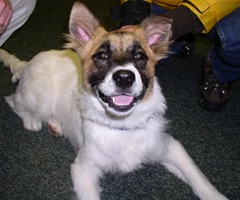 There are Australian Cattle Dogs, Border Collies, Wheaton Terriers, Jack Russell Terriers. There are even Great Danes, Mastiffs, and Great Pyrenees. Most are surrendered because their people didn't think before they chose (condos and Cattle Dogs don't mix well) or because a family cannot or will not afford to take care of them, or because a new baby entered the picture and the once loved furchild of the family is no longer important. These animals did nothing wrong. But because it is easy for people to dump responsibility at a local shelter, these animals--confused, sad, shocked, depressed--most often die alone and afraid. They are tossed in a garbage can like every other stray. It is unconscionable. Right now, at our house, a big beautiful polar bear of a dog who was left to die is choosing one of four pieces of furniture on which to snore (two Restoration Hardware sofas and two ergonomically designed beds), He will have his two walks today, eat the best food a pup can possibly be fed, get a special snacks of grilled chicken tonight (daddy cooks for him), and take his vitamin supplements that make him feel like a puppy. He will get kisses and hugs and be told how amazing and wonderful he is--how much he is loved. And he will understand, because he is a rescue dog. He wasn't purchased like a pair of shoes or a purse. 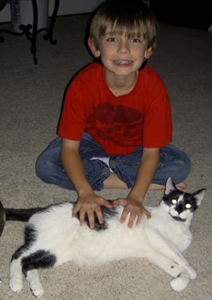 He was adopted into a family of which he is a cherished member--yes, with all his challenges and all his vet bills. And he pays us back a million times over. Right now, millions of purebred dogs languish in shelters, hoping to be as lucky as Julius. DESERVING to be as lucky as Julius. So if you are considering buying a designer dog from a breeder. . . please, please think again. Because we will tell you--the joys of being Julius' parents are infinite. I just wanted to give you an update on our adorable Tinker. When we first brought him home, he was very shy. As each day passed he became more settled and comfortable with us. He and my son, Jaydon, are the very best of friends. They are pretty much inseperable. This adoption was certainly meant to be for both of them. We have a very large extended family and have had them over several times since Tinker came to live with us. I was worried that he would be frightened. Not the case as he sits on the stairs and waits for each and every one to pet and play with him. His 2 favorite places in the house are: anywhere Jaydon is and looking at the fish tank. He is so funny with the fish. They kind of taunt him and he is just bound and detemined that he is going to get them one of theses days. This has become a morning and evening ritual. So funny! I have attached a few pics for your viewing pleasure. Thank you for allowing us to adopt this wonderful kitty. We just love him to bits!